As with learning to juggle balls, it is beneficial to learn the pattern with one ring first, then move on to two and three. Also, rings require specific technique which is fastest to learn with one ring first. Start with one ring; practice tossing from hand to hand in a crossing (cascade) pattern. Your throws should be a bit higher than those used for juggling balls... about 2 feet above each shoulder is good. 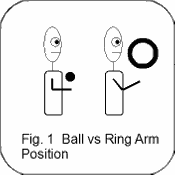 Proper ring juggling technique requires a higher hand position when catching, and is employs a bit more of a whole-arm throw (see fig. 1). If you find that the ring is shooting back behind you, it's probably because your using too much wrist and forearm to throw... think of trying to loft the ring straight up into the air with just a touch of spin to help stabilize it. After you can throw and catch the ring at least 10 times in a row, you're ready to move on. Hold one ring in each hand. Toss one, wait for it to reach it's peak, throw the second one. Catch. Catch. If the rings are hitting each other, it's because you're not throwing high enough... rings love to go high! Get this 10 times in a row, then move on. Hold two rings in one hand (see photo for proper grip), and one in the other. Throw the first, when it reaches it's peak throw the second, then at it's peak, throw the third. Catch them all. Ta Da! You are a ring juggler! Ring juggling is all about technique, and technique is all about practice! The best drill you can do to get better at ring juggling is with a single ring; throwing back and forth from hand to hand. Start out with low throws, then work up to higher and higher throws with accuracy.